Arguably the best All-Star Game contest in all of sports takes place Monday night in Miami. 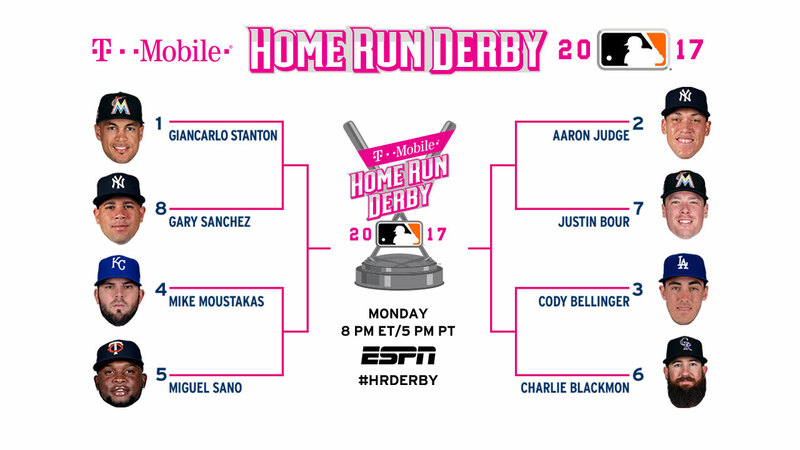 The Major League Baseball Home Run Derby is set for Marlins Park and the field is the strongest in years – maybe ever. If you haven’t watched in recent years – or are a first-timer – the derby is no longer the classic 10-out format that it used to be. It is now a timed event with bonus time awarded for long home runs. This has led to more swings and more HRs, which should favor a more physically fit player. One of the fittest players in all of baseball, Giancarlo Stanton, is the defending champion and slight favorite (+160) in this year’s event that will take place in his ballpark. Open an Account at Bovada Sportsbook Now! Sign up at Bovada.lv to get up to a $250 Deposit Bonus and to bet all the Web’s best MLB Baseball odds and props! The New York Yankees’ Aaron Judge is the second choice at +180 and will have many bettors taking him as the Yanks are one of the most popular public teams. With a 495-footer (according to StatCast) on June 11th, Judge has the longest home run of the season thus far. He also broke Joe DiMaggio’s record for the most home runs by a New York Yankees rookie in a season with his 30th homer of the year the other day. Prediction: Stanton and Judge are the clear-cut favorites and will probably make it to the finals, but you really don’t get rewarded if one of those wins. Let’s assume that only one of them will make it to the finals. If that’s the case, here’s how I think it may play out. 2nd Round: Sano over Stanton. Sano is my dark-horse choice to win this thing. He is strong enough to hit monster home runs that will only increase his time at the plate. Sano is a favorable +800 to win. Judge over Bellinger. I don’t think Bellinger has what it takes to win a contest like this with his big swing. He’ll tire out. FINALS: Judge over Sano. Taking Sano would payoff nicely, but I don’t see any contestant coming close to beating the rookie. Judge’s homers are typically lasers that get over the fence in a hurry – that gives him a few more swings than anyone else. LIVE IN-GAME MLB BASEBALL BETTING!